The oesophagus is a hollow, tubular organ which connects the pharynx to the stomach and is around 25-30cm in length. The organisation of the layers in its wall follows the basic pattern of much of the gastrointestinal tract. The innermost layer is the mucosa. In the oesophagus this is formed by stratified squamous mucosa. Situated beneath the mucosa is the submucosa, which is a layer of connective tissue. In the oesophagus the submucosa also contains mucus glands which open onto the surface of the mucosa and help to lubricate the lining of the oesophagus. The muscularis propria is located under the submucosa. It possesses two sublayers, an inner circular layer and an outer longitudinal layer. In the upper third of the oesophagus the muscle is skeletal muscle, in the middle third it is a mixture of skeletal muscle and smooth muscle and in the lower third it is smooth muscle. The presence of skeletal muscle in the upper third of the oesophagus reflects the voluntary control that exists over the initiation of swallowing and the need to have the rapid response to a command to swallow. One the food has safely entered the oesophagus smooth muscle can take over the job of moving it towards and into the stomach. The outermost layer of the oesophagus is the adventia and is composed of connective tissue. In other parts of the GI tract this layer includes a coating of peritoneum and is referred to as the serosa. The oesophagus begins at the lower border of the pharynx at the level of the sixth cervical vertebra. It descends through the neck into the superior mediastinum then the posterior mediastinum to leave the thorax through the oesophageal hiatus in the diaphgram which is located at the level of the tenth thoracic vertebra. There is only a distance of around 1-2cm within the abdomen before the oesophagus joins the stomach. The oesophagus is closely related to various other organs during its journey to the stomach. Some of these relations are important because they can be invaded by tumours of the oesophagus, or tumours of these organs can compress or invade the oesophagus. The oesophagus is situated in front of the vertebral column. Within the neck the lobes of the thyroid gland are located laterally to the oesophagus; the trachea and laryngeal nerves are in front. In the mediastinum the left main bronchus is a particularly important relation of the oesophagus and crosses in front of it at the level of the fourth to fifth thoracic vertebra. The aortic arch passes in front of the oesophagus at the T3 level and the left atrium is found in front of the oesophagus at the T6/T7 level. The lateral sides of the oesophagus are close to the medial surfaces of the lungs. The descending thoracic aorta is behind and to the left of the oesophagus. The vagus nerves keep close company with the oesophagus; the left vagus nerve travels on the front of the oesophagus and the right vagus nerve tucks in behind. The blood supply of the oesophagus is different for different parts of the organ. The upper third is supplied by the inferior thyroid artery, the middle third receives branches of the descending thoracic aorta and the lower third is handled by the left gastric artery. The venous drainage follows the arteries, with the exception that the middle third drains into the azygos vein. 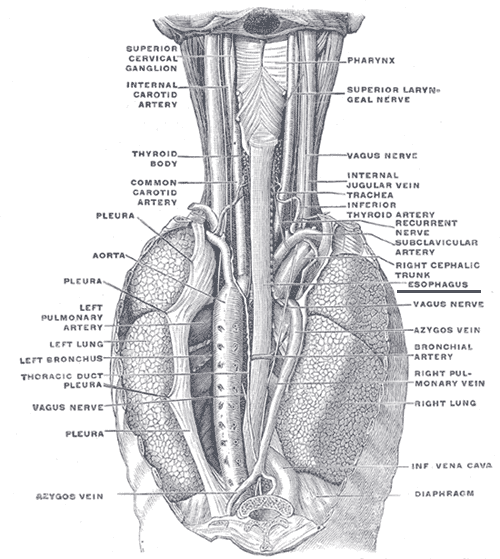 The oesophagus is innervated by the vagus nerve and the thoracic sympathetic nerve trunks. The role of the oesophagus is to transport food from the mouth to the stomach. Food is swallowed from the oral cavity into the laryngopharynx in the form of a mass known as a bolus. This bolus enters the oesophagus and is moved along the oesophagus by co-ordinated muscular contractions which are known as peristalsis. Under normal circumstances persistalsis is assisted by gravity but it is possible to swallow both food and liquids in an upside down position (against gravity) or in a weightless environment. The two layers of muscle in the muscularis propria of the oesophagus permit peristalsis; the small intestine and the large bowel employ the same principles. Contraction of the circular muscle narrows the lumen of the oesophagus and contraction of the longitudinal muscle dilates the oesophagus. 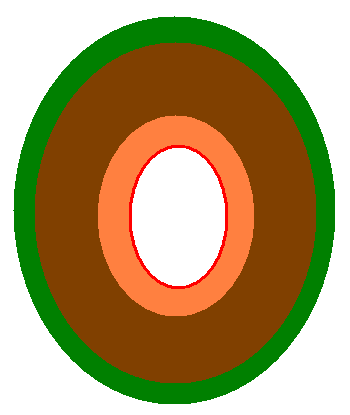 Appropriate sequences of contraction and relaxation of these two layers allow the oesophagus to squeeze the food down its length. The churning action of the stomach requires there to be a mechanism which prevents food from being squirted back up into the oesophagus while the stomach is in full flow. The typical solution in such situations is for a sphincer to exist between two hollows organs if the movement of the luminal contents between the two needs to be controlled. However, no specialised structure that could be designated a sphincter on anatomical grounds has been demonstrated at the gastro-oesophageal junction. Nevertheless, the lower part of the oesophagus maintains a state of contraction in its circular smooth muscle so that this part of the smooth muscle functions as a sphincter. Relaxation of this portion of the smooth muscle is necessary to permit food to enter the stomach. The passage of the oesophagus through the diaphragm may also contribute to the functional sphincter. The oesophagus can be considered in the category of a hollow organ. The entire circumference of the oesophagus should be considered to be a margin and the utility of differential inking should be borne in mind. Dissection and demonstration of the key aspects of a tumour may be facilitated if the oesophagectomy specimen is not opened through the tumour.